Customers today at work made it ugly - expecting Jetsons-like materialization of things from different places all around the state so they could have not two but THREE matching sets of something huge that no store had three matching sets of. I doubt they could find a furniture store that had three matching sets of any whole room set they were looking for and have it all delivered within a week, much less bathtubs. And they couldn't understand why you cannot pay for it at one store in one state and just have it 'magically' arrange itself from all of the other stores and arrive at their doorstep this Friday. And some of the things were closeouts. And some were available at larger stores but not at OUR smaller store. So I had to explain not all stores of the same name carry the exact same merchandise, it depends on the size of the town etc.. This was not something they knew about, and it was confusing. They still wanted the other things that I couldn't get. Finally I told them I work at THIS store, and I would get a manager to try to work it out... and they did, with things we did carry. They're happy, sort of. It was just very frustrating for everyone involved. Maybe the Jetsons technology will come to our industry some day - but I guess for now we'll all have to work with what we have. And yes, that was the ugly. The bad was the rain this morning and the generally bad mood of most people involved with retail today. I had lots of squeakiness and 'but I can't tell you what brand it is, no I didn't bring any part of it with me, but it isn't working so fix it' and 'can you believe they only have one of these when I want two' attitudes today. The good? I came home, and hugged a little girl, and gave her a bath, and while she was taking her extra long bath with a 'beautiful' purple nail brush talking to toy pigs and dogs and kitties and other things - I made an open-faced pastrami sandwich, drank some coffee and watched her swim around. We are about to watch Cinderella and go to bed. I have two days off now (one with a sewing lesson) and hope to do something fun with her tomorrow, maybe library, maybe Grandma's house... we'll see. Hi! Hi! woof woof! Save me Mac! Throw a rope! Jump! I WILL catch you! Look! A butterfly! woof woof! Esme playing with her plastic toy dogs. One of them is new and it is meeting the other one and saying 'I will catch you' to the other dog, just like in the movie Despicable Me from last night. 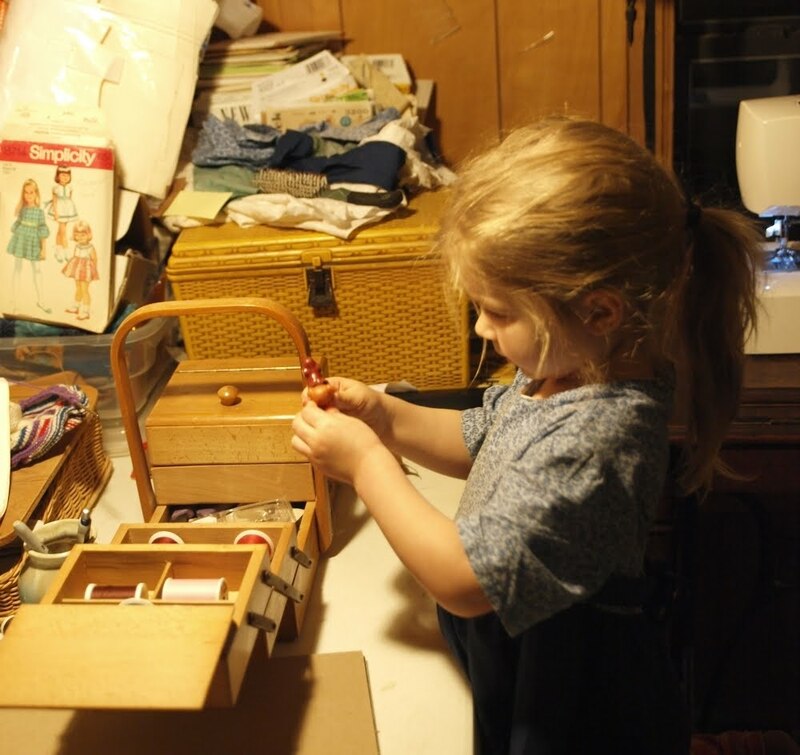 They were playing up and down the 'stairs' of my wooden sewing box that Mark gave to me, pretending it was a precarious surface. Then one dog saw a butterfly out the window, and pointed it out to us. Later she was stretching her old telephone's cord across the room to a bucket and playing almost the same game with other toys. All in very poor light - but it was worth a try to get a picture ;) I did finish her other navy-skirted dress with the long sleeves and pockets on the skirt. I'll see if she will put it on tomorrow. By some odd luck of the draw the pattern that they were made with is still visible in the background of these photos. The scrap remnants of the fabric are there too, on top of my mom's old sewing box. I have to go to work today, and it this week is dragging a bit because the next day off is Tuesday. We watched 'Despicable Me' last night and it was very very good. I had to thank Daddy for getting it. It wasn't at all like what I thought it was. Esme really liked it too, sitting there entranced for most of it at the end of our bed. I should finish Esme's other blue dress that is just needing a hem, a pocket and a zipper. It got put up at midnight one night and I haven't touched it since because I keep forgetting it is there. Her last blue dress with the navy skirt is working out so nicely compared to the set just before it - hardly any arm problems and it looks and moves so nicely with her. The jacket pattern still has not come in the mail. I guess it might come Monday. I've got in mind a pink bitty floral pattern for a spring/summer type jacket for Esme. I haven't seen the fabric in real life yet - it is just there in my head, so once I get the pattern and see how much fabric I'll know what to look for. I've got my eye on the pattern below, as well... but am waiting to see if this one that is coming is in good enough shape to use. 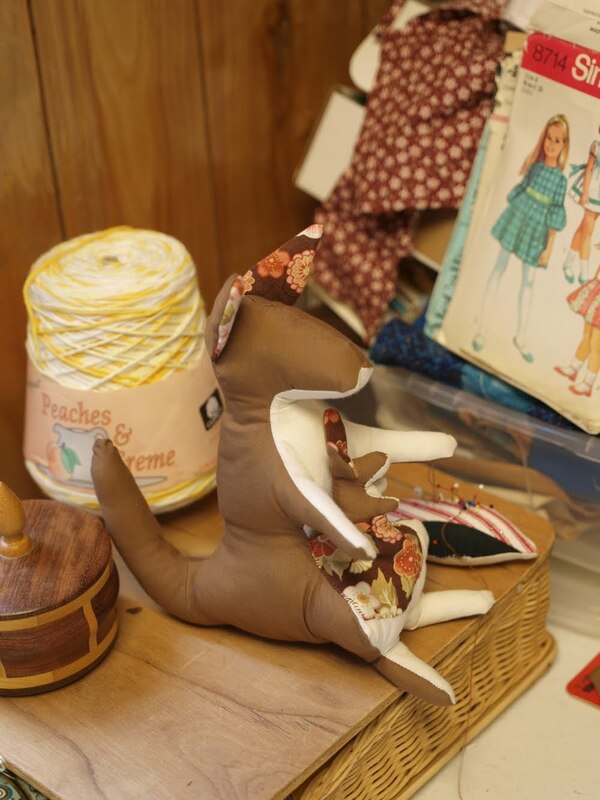 I have another sewing student meetup on Wednesday in Paris, which is nice - and during lunch hour at work I am hand-sewing the baby kangaroos for a set to put in the shop. Otherwise this morning I am wandering around in the kitchen in my homemade pajamas and slipper socks, drinking coffee - wishing I didn't have to leave the house today as it is thundering outside and everyone else is still asleep etc etc.... listening to Nova dog grumble and whine because she got wet out there and Pogo cat tried to rub on her. Tansy dog is sniffing around where she hears kittens under the couch. Mitzi mama cat is sitting in front of the couch looking proud and telling Tansy 'so there' about hiding her kittens too far under there for Tansy to get a good look. Esme has really been taking this at her own pace - and I decided to try to move things along a little faster by taking the obstacle of the stairs away. I should have done it a long time ago. Now the trainer is upstairs right next to her changing table - and she has been using it. Several days in a row I've had her without diapers but never for more than a few hours at a time - something else comes up like she falls asleep, or wants a bath, or we go to town etc. But - last time I tried this she would pee on the floor every five minutes.. and now she can hold it most of the time and the only accident we had the other day was when I knew it was time for her to go but she did not want to agree and I didn't push it as hard as usual. 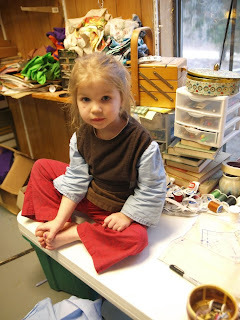 And then she came to me asking for new pants and was very sad about not having anything to put in the potty. She has also been using the 'big potty' a few times now with mama holding her because the trainer is upstairs. And - a larger leap this morning! I've been asking her every morning before I change her diaper and at night before she gets the last one to use the potty before the diaper. And this morning I came up from making my coffee and found her sitting pants-down with her diaper on trying to use the potty and had made a grand effort at getting the diaper off but with no luck. Big progress! 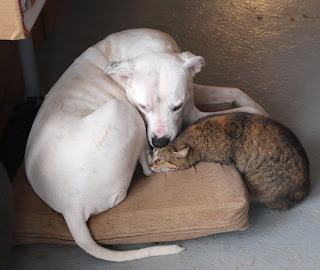 Bunny, our 'AmStaff' American Staffordshire pit bull, being mugged by our cat Pogo. 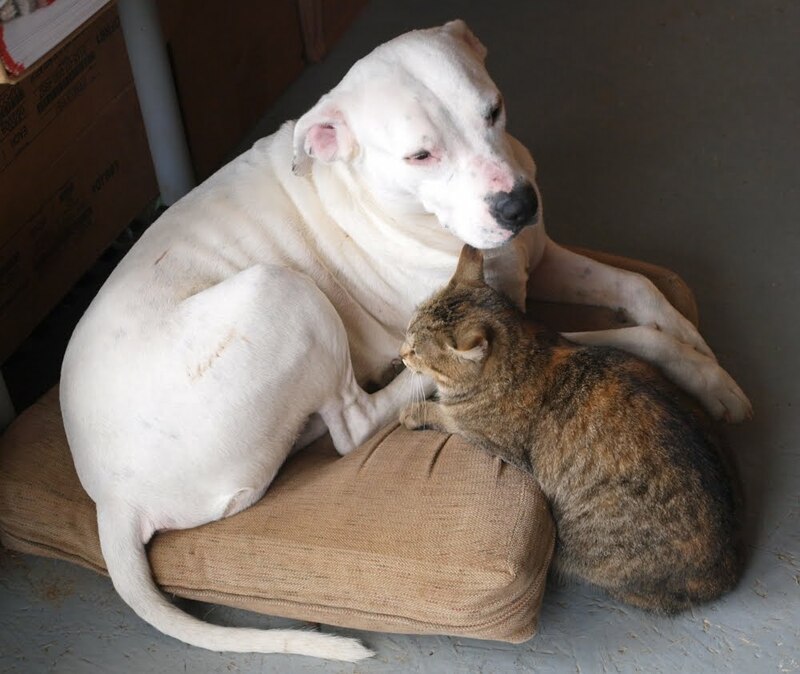 She will sit there and rub against Bunny's side over and over until Bunny cleans her ears. Finally, Bun dog obliges. The grooming begins, until one feels too undignified to continue. Esme deciding between an apple and a lollipop. 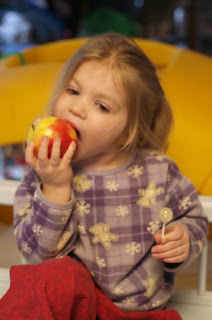 The apple won, and was chewed nearly to the core. 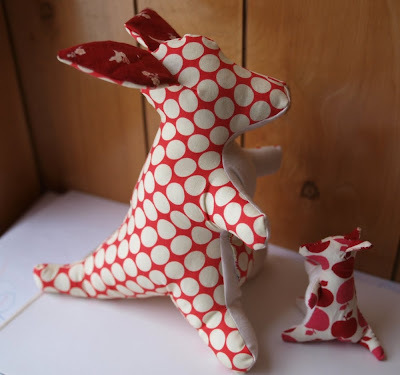 The new kangaroo and baby joey pattern, made and tested. Esme really likes them - they go hop. When I was making the baby she came over and saw the pieces and said 'What happened? Where the baby? What have you done?' And the kangaroo mama cried and hopped all over the desk and fell down. We are trying more PT today. It is not too successful, and I doubt it will get 'easier' as she gets older. She tells me to be quiet and shut up when she doesn't want to hear 'do you need to go pee?' again and again. LATER She went two hours with just one accident. I moved the trainer upstairs so she didn't have going downstairs to complain about. She used it several times and emptied it outside. I put a diaper on her before she napped, had dinner and went to see Grandma and Grandpa. She used the big potty again - which she is not completely petrified of anymore but still not happy about. Then after her bath (major meltdown at the end of it followed immediately by 'who, me? I wasn't crying at all' behavior) she used it one more time before getting ready for bed. We are making a little bit of progress. 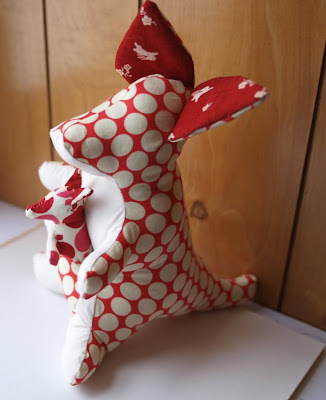 I have another customer from my Etsy site who would like the pattern to make this kangaroo. I have to find it, test it again, scan it in and PDF it. I haven't done that with this one yet because it is quite difficult compared to the other patterns I put up in my shop. And - the baby is sewn entirely by hand. I am going to make the pattern available on a 'no instructions' basis. It will probably be the same cost as my basic pattern that has instructions - because it is a more advanced pattern. 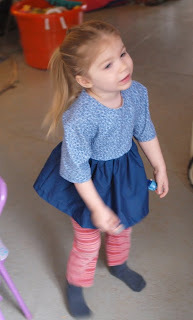 In other news I am almost finished with Esme's second navy-skirted dress. I also found a 1943 sewing book at the library book sale today. It has beautiful two-color plates in it and a lot of 'save the garment' pages that just aren't seen in books from today. 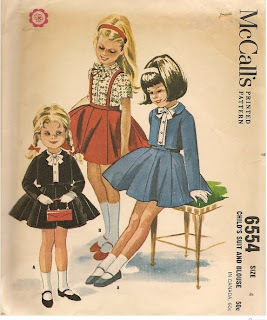 It suggests on one page that when a little girl's dress becomes too small in the shoulders or too short in the skirt cutting it apart and putting in a contrasting panel to the chest or cutting the skirt halfway around and putting a contrasting stripe in it to lengthen it. Very common-sense, but also wonderful to see down in text! I have an appointment to give a sewing lesson tomorrow. I need to remember to clean my machine tonight as she does not have her own to use. 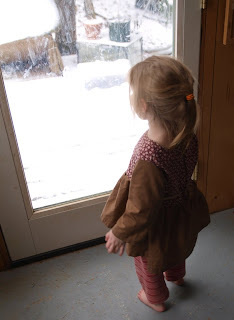 Poor Esme is going to think Mumum is going to work instead of usually going to town with her on a day off. Also, for the record - Esme is calling me 'mom' more now than 'mumum'. It's been happening for a while, and I keep forgetting to jot it down. It sounds so funny now that I've gotten used to mumum! I closed the truck door on my hand yesterday on the way to work and Esme is VERY interested in how the truck 'bit' me and is roleplaying her mumum dollhouse doll saying she has an 'ow' on her hand and it happened at the truck. I feel VERY dumb having done it - as I was trying to get the seatbelt out of the door with one hand and balancing myself with the other on the doorframe... and when the seatbelt came loose the door closed .. on my hand, just hard enough to make me really wish I had been smarter! Esme's imagination is in full gear this morning. She has given her baby mouse 'ride the turtles' on both the mumum and daddy dolls and is fighting a dragon with her playdough knife. A few moments ago I stuck a velcro-sided lemon in his mouth and he is crying because it is stuck. 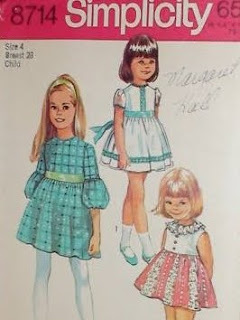 This is the dress from the remade pattern for Lizzie. The morning light isn't being too kind this early, but I have to go to work - so here we are. It is shortened to wear over pants. I finished one 'knee-high' sock for myself down to turning and then regathering the heel. Then we all went to bed after that. 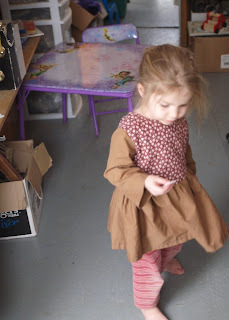 BIT:: I tried Lizzie's dress on Esme just to see if the sleeves would work (I had trouble hemming them up) and they do - plus the shoulders are VERY wide for Esme - it nearly falls off of her. And yet, they are the same as the last one I made for Lizzie with just a little extra neckline cut out in the middle. Lizzie is MUCH larger than Esme! I bet if we stood them side by side it would look like Esme was the younger one, when in fact Lizzie is a month younger by date and was supposed to be born three months later than Esme! It's Friday, and I have the day off. I am hoping to get Lizzie's dress finished and start another pair of pants for her and/or Esme. 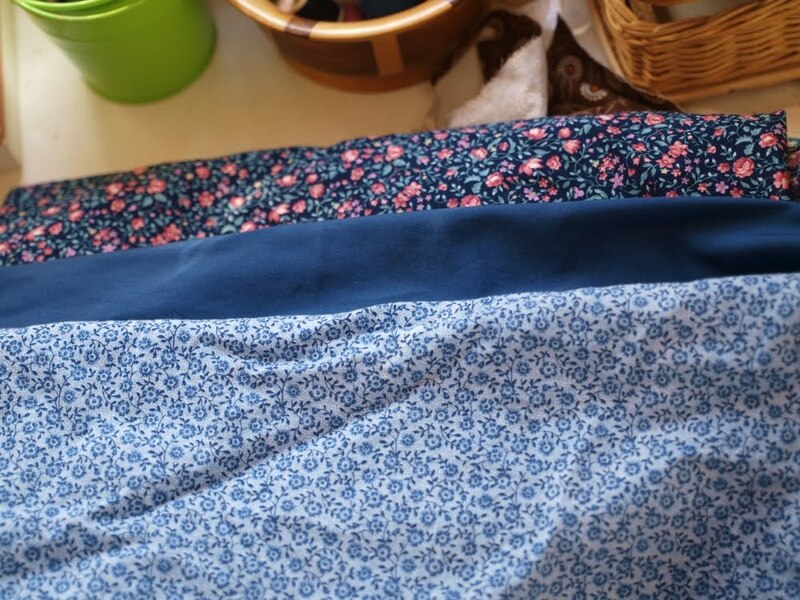 I also have Esme's other dark blue dress to work on - but not sure if I'll get to that one until next week. Esme has been running Daddy around quite a bit the last few days. She was asleep last night again when I came home and then demanded an hour-long bath. I knitted on my sock while she was in there and she splashed me and the cat! Nana called from Minnesota and talked to us for a little while before bed. ordered this last night size 4 coat and dress pattern. I hope the coat is complete in the pieces. Also coming in the mail (bought it last week) is this in a size 5. 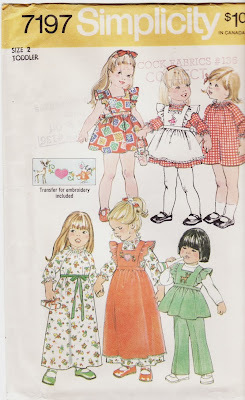 This is the pattern (in size 2) I had altered my raglan sleeve dresses from - of which Esme wore so many the past year and a half and several went out in the mail to other little girls. I saw it at a good steal and put a bid on it - and will be happy to see it arrive. 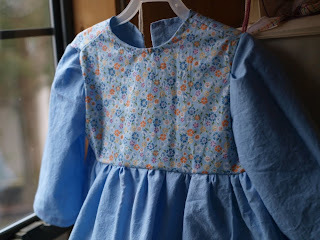 LATER: I've finished Lizzie's dress, but will need to photograph it in the morning light. Esme had a nice visit with her grandparents and Daddy came to get us when it rained. She asked me to play blocks and give her 'whee' and everything else all around the room. She had a busy morning and afternoon - by four o'clock she really wanted a bath! I told her not now, later (as I was sewing a dress tie on at the time) and she went and got in trouble on the other side of the room. 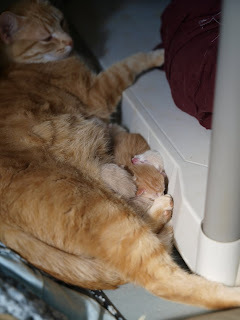 Then - after Daddy had swatted her away from the kittens for the second time - she fell asleep and is still napping at six. I think I'll go grab the sock I was knitting and sit beside her while she naps for a bit. Daddy bought 'Top Gear' highlights this morning on DVD and it is QUITE funny. It is like Monty Python meets Car Talk. Esme was up bright and early at seven this morning after fighting hard not to go to sleep until 11:30 at night. But, she had a long nap yesterday after a busy morning outside playing with Daddy in this warm weather. 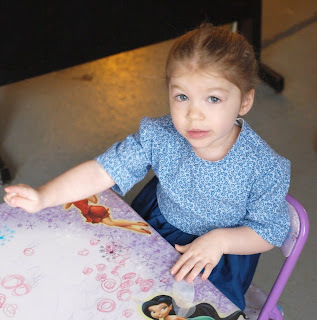 This is the blue fabric Esme picked out for herself. As soon as she put it on she told me 'go get da CAMERA'. Hmm. Is that because she likes it so much or because that is what Mumum usually does with a new dress? Hehe. Maybe both. She told the dogs she had a pretty blue dress. And she has learned to curtsy even better from Alice in Wonderland. It is almost exactly the same pattern as the 'blue day dress' with a slightly lower neckline, no waist darts and short sleeves. The skirt lost a tiny bit of fullness with leaving out the waist darts but I had no trouble with her arms in this one... ?? It does not have a dropped waist - without that, the dress looks like it is too small for her - but in actual performance running around all day, a dress like this seems to work well on her. 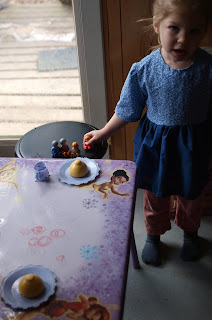 She decided to serve all of her playmobil family tea and give them lemons to eat. She brought everyone over on her own - arranged plates and food and then I showed her where her 'teapot' was and she started giving them all drinks of tea. 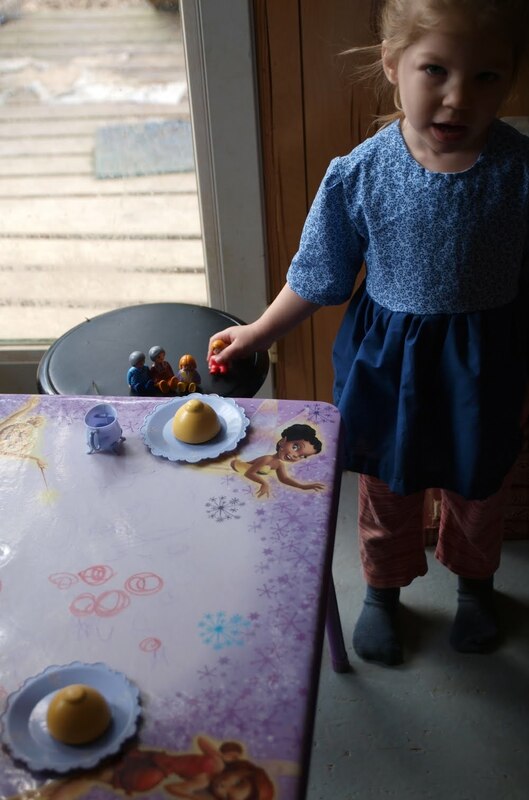 The baby jumped up and said 'I wanna tea TOO' and she told him he could have some but then went on to play with the rest of her menagerie of little figures - cats, mice, monsters, horses... The grandpa took a ride on the playmobil horse all around the room and then came back and said 'I came home!' and put the horse away. I liked this last one because the skirt of the dress is very well defined. On her it actually does not look this full! I brought nothing else to work today to take up the leftover lunch hour - so instead I drew out plans for how to alter Lizzie's dress. I had worked them out in my mind using her picture, so I'll see how it comes together with the actual pattern tonight. 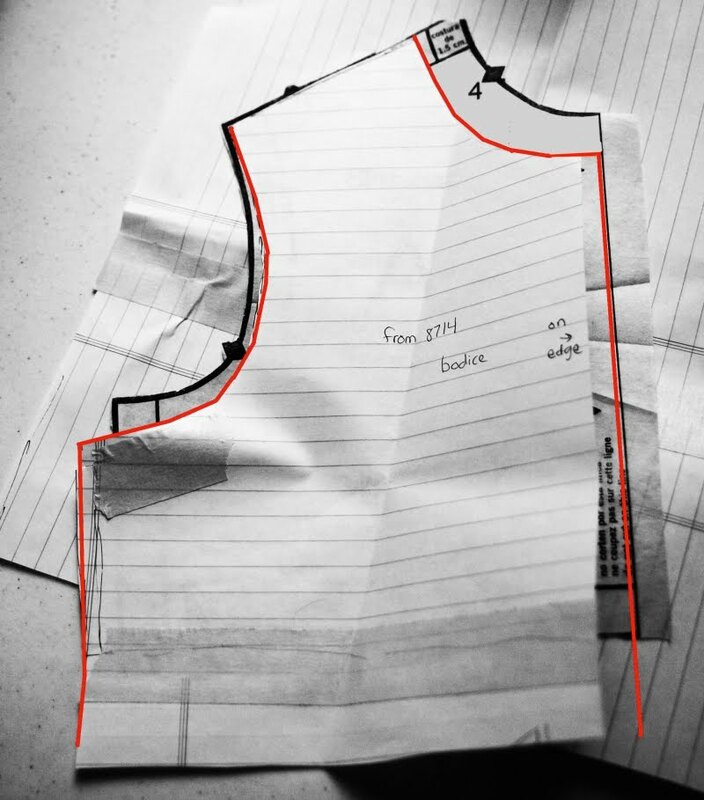 Altering Esme's dress using the photograph and a mathematical plan worked really well. Step 8: Do all facings and hems. Step 9: Pin and sew in the zipper by hand. Step 12: Get pictures and see if did a good job! I've also signed up to a new service on skillpages. 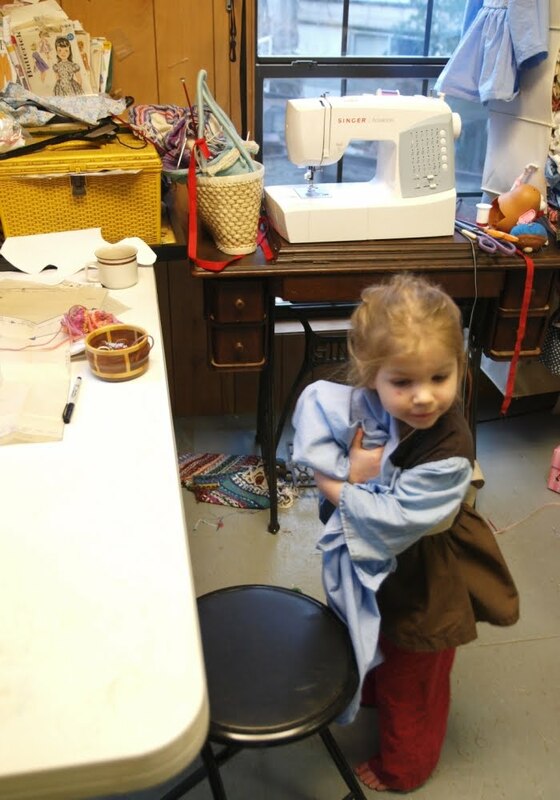 I'll see if I get anyone else who would like me to try altering or making clothes for their little ones near here. I know people are always looking for someone to take up curtains by 6 inches or split a panel of curtains or etc... so I would be willing to do something small like that as well. 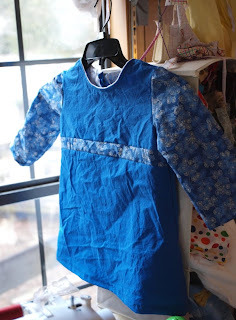 I have finished Esme's short-sleeved blue dress and the other one is cut out and waiting to be made up. It was a beautiful day out - and Esme and Daddy went walking and visited Grandma and Grandpa. I got to see a gorgeous sunset just as I came home. Esme is napping now, so I'll go to the machine and see what I can do. Mitzi graced us with these little furballs yesterday when I was at work. These are the socks I made which Esme does not like. They are just like the ones I made for myself. I've been wearing mine, so they are much less photogenic. These do fit her, but do not go up to the knee, which is her complaint. These toddler socks were made with Red Heart yarn on size 3 double pointed needles. They started with a cast on of 39 stitches 1x1 rib with a 17 stitch heel. She wants knee-highs but I am not sure what number to start at or how to decrease for those.. so it may be a while before I try again for her. I'm trying to make a pair of knee-highs for myself first (because if I succeed I WILL wear them) so I can see what the proportions are of the decreases. This is the blue fabric I have that is to make two more dresses. I already had the one at the top, and bought enough of the middle to work with both of them. Esme picked out the one on the bottom as pretty. I did a lot of cleaning this morning, laundry and sorting out of things. There were some things in our dresser that were from when Esme was less than a year old, stray socks and bibs and summer things that will not fit this year around. Then we went to town for a little bit. 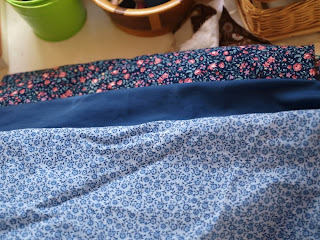 I am hoping to sit down at the sewing machine in a bit and make up one more of each of the dresses I made last week, one of the 'remake' and one of the 'blue day dress' ones as well. Even though I felt the latter was a bit ill-fitting my opinion of it has improved the more she wears it. It's turning out to be a productive Sunday. 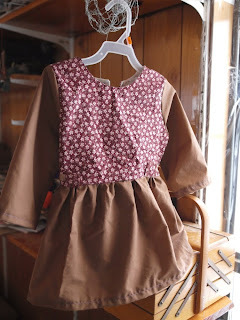 LATER: I am working on the dresses for Esme, have one half done. 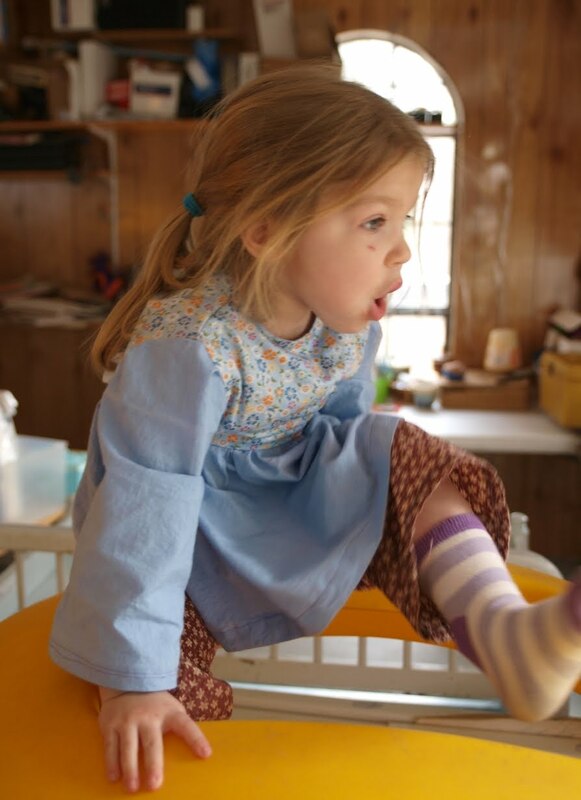 SIL sent me this picture of Lizzie in the dress I made for her. I can see where it needs altering to fit her better in the shoulders and where to put the waistline for a bigger skirt. 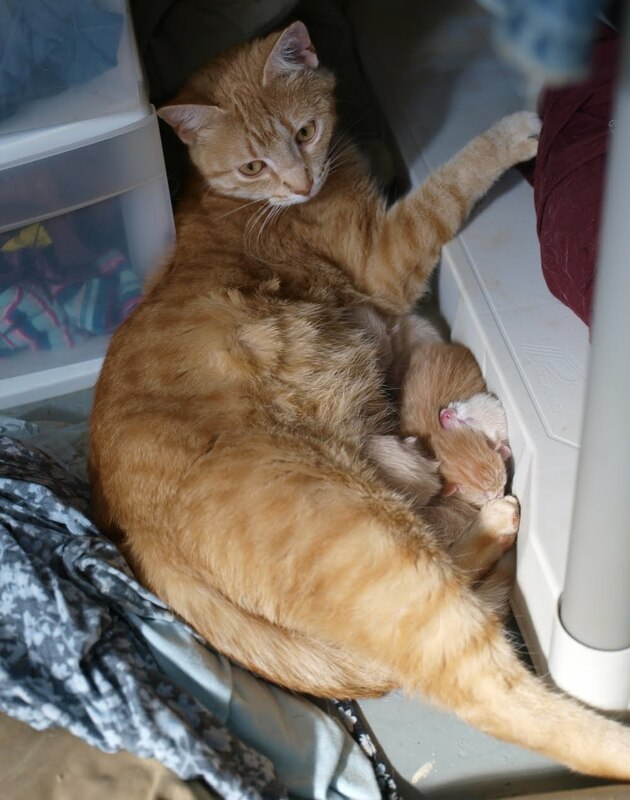 We have four extra fuzzy furballs in the house tonight, thanks to a yellow cat. I finished Esme's knit socks but she does not like them. She took them off, put them on our bed and said 'do not want'. 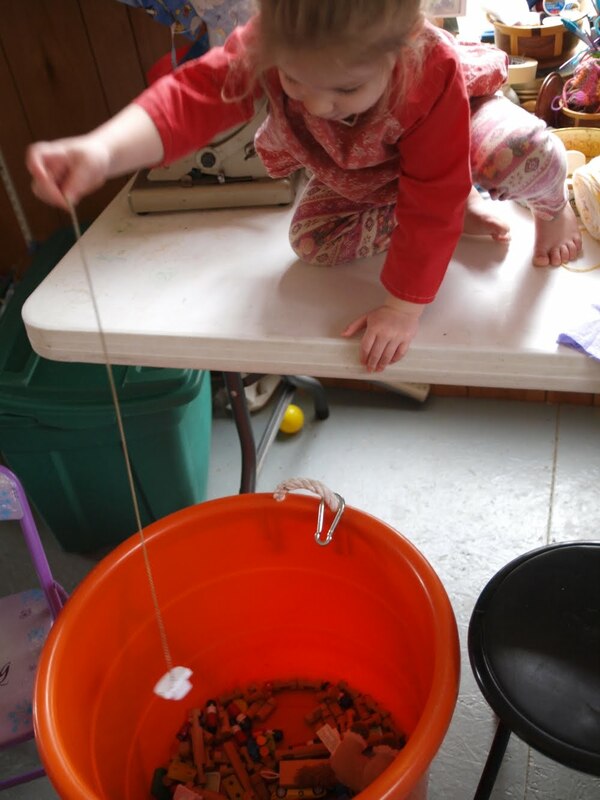 She liked the yarn, but doesn't like the finished product because they don't go up to her knees. That made me sad - but oh well :( I'm not sure if I want to try to knit her knee-highs or not... will have to think on it. Esme's knit scarf (with her name crocheted on it). My knitted hat, scarf and gloves. House jackets and drawstring pants made for myself. Green dress and sleeveless shirt made for myself. Dishcloths galore in the kitchen. Lots of handmade toys including Clarence the dragon and the snake. 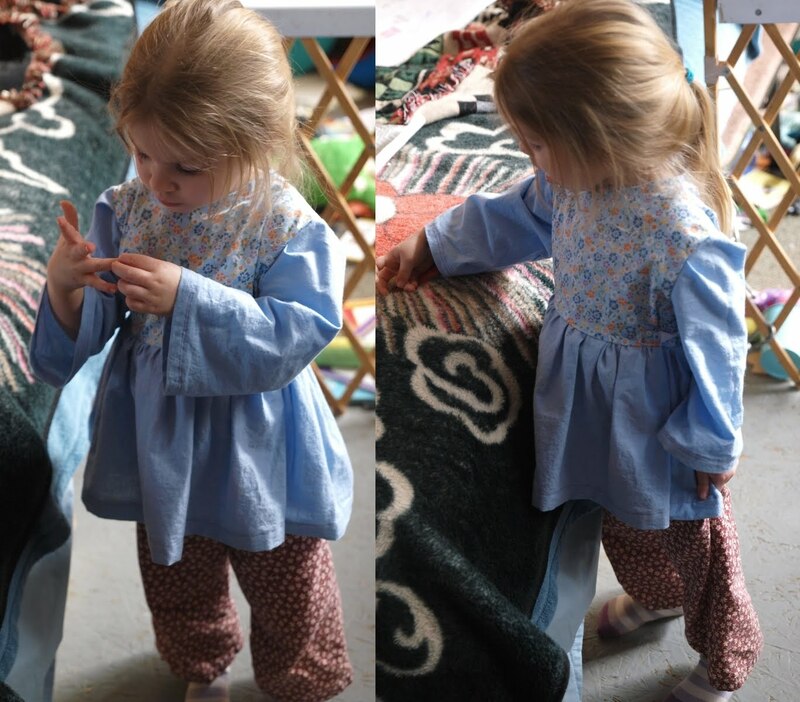 Lots of handmade dresses and pants for Esme constantly replaced as she grows. The green dress doesn't fit me as tightly as it did when I made it. That is a good thing, I guess - because I've lost a little weight. But.. *growl*.. maybe I can put a pair of ties on it. I still need to take the sleeves out of it and replace them with something better and more 'smooth.' The sleeveless shirt is okay to wear for bed but the elastic band across the back pulls it up too much. Both of those are examples of 'wearable' but not well done. Esme says this is a whale. 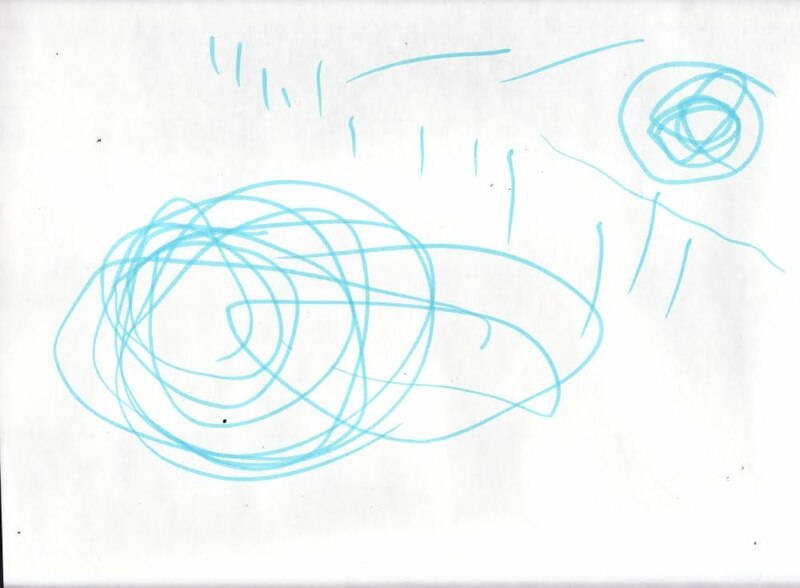 She drew this by herself last night while talking to my mom on the phone. 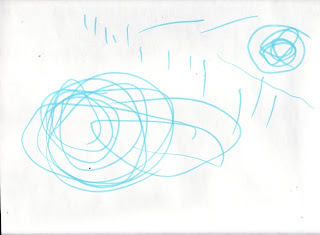 I'm posting this because she hardly ever tells me her drawings 'are' anything - usually her point is to scribble colors. Tonight she was very adamant that THIS mumum.. is a whale, and she pointed to the large oblong with a 'fin' in the middle of him and said yes, that, that a whale. She knows what whales are only from TV - Finding Nemo and her favorite movie lately Pinocchio. One of the drawings I had made for her last week (and had her help me draw bits on copying) was a big fish with hair all along his back - he had eaten socks and apples. I think the vertical lines along the top of the drawing were her attempt to put hair on the whale because he is a fish too and I asked her if he was the whale from Pinocchio who ate Pinocchio's daddy. She found that fish drawing and told Nana about it and the fact that he had a big belly and a tail and had apples. And this is the 'remake', which I am happy with. I like the way it fits in the neck and shoulders much better with the alterations. It pulls just slightly near the shoulders where I have it held back with ties - but that is a good place for it to do that - it gives her extra room if she needs it and the ties hold it closer to her waist. The coloring could have been much better for her -- but it was remnant material, and I think it turned out fairly well for something I wasn't sure was going to work out. I may have even solved the 'second arm' problem, at least temporarily. How? I made her give me the opposite arm (the one she is having trouble with before) first - get it in - and then somehow the other arm went in just fine. That could be because I 'slowed her down' by asking for the opposite arm and she had to think hard instead of just full-speed ahead. If I continue to use the opposite arm first she may go right back to having the problem? We'll see. I think she needs another one in dark blue or medium green. I've had my eye on this one for a while - the artwork is beautiful and the pattern itself is elegant, easy to alter into a number of different things. Ever since I saw it has been much too rich for my blood - and of course being vintage the supply is limited. So... when I saw this size 6 for 'decent price' today I bought it. I often feel guilty about buying supplies that are not 'steals' well before I'll use them. BUT - I can't feel all that guilty about this one - because I've used size 5's for Lizzie lately and I know I will use it in the future for Esme. It still cost less shipped than a full-price childrens t-shirt would cost - and will return much more that in finished garments. Yes - I'm still trying to justify it *ha*... that is just how I am. I didn't attempt to go to work today because of the weather and the condition the roads were in yesterday. Esme and I did go and 'play snowball' earlier and ended up at Grandma's. She has been a pretty good little girl all day. I haven't done much else except knit on a sock a little, play with Esme and watch tv or get food/drinks with her. I did notice this morning while doing the laundry that Esme's cow dress and Cinderella dress both really need to be replaced -- the cow dress because of what Nova puppy did to the ties and the other because the fabric is fraying on the inside. There are quite a few things that need to be weeded out again and replaced since she has also grown some and I wash clothes hard and often. So... my latest round of dressmaking has not been without need. I do, however, need to convince myself to make her more pants AND dresses ... because the pants are hardly ever exciting but they are necessary ;) She told me she didn't like the knit sock I made 1.) because there were only one of them at the time and 2.) because it didn't pull all the way up to her knee like her other socks. Mumum will have to see what I can do about that if she still doesn't like them after the second sock is done. Among other things on my mind are wondering how she got a scrape under her lip yesterday. It doesn't seem to bother her but I keep thinking it is koolaid or food and trying to wash it off. And later tonight she put her playmobil dolls through a small hole in her activity cube and got her hand stuck in there trying to get one out the way it went in... *sigh* But she'll get over it with just a bruise and maybe the knowledge not to get stuck in a 'raccoon trap' again. I'm also hoping Mark can drive me into work tomorrow, he's still trying to get over his cold and this weather is formidable. 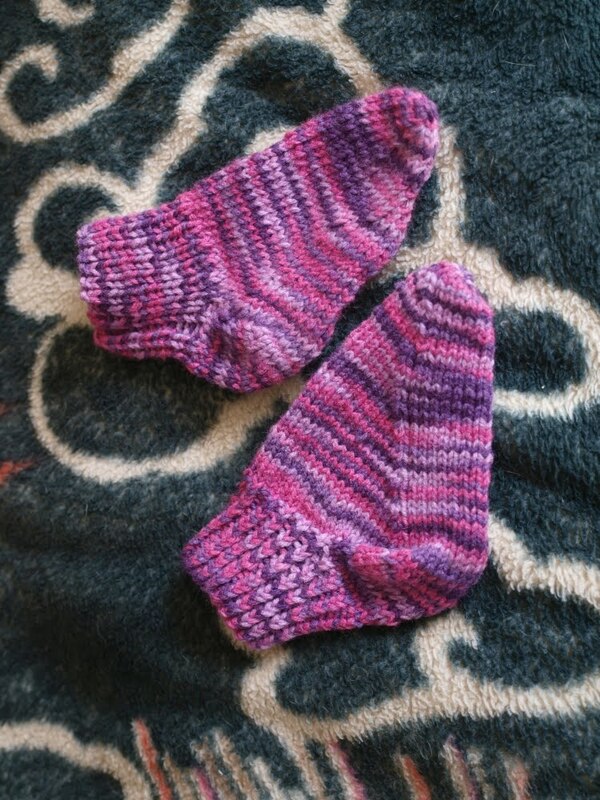 It's nice today to have gotten my pair of slipper socks finished - out of one skein of 'Vanna's choice' lion brand yarn. It is soft and slightly thinner than regular Red Heart acrylic. It has less bounce and a tighter knit - which is a good and a bad thing. The cloth is very very dense. They are nice because with these on over my regular socks I can't feel the cold on the cement floor downstairs - which chills right through a pair of normal socks! The bad thing about it being so dense is it seemed to take forever to make them compared to the bouncier, fuller acrylic. There already is another color I'm thinking of getting next time I am at the store. I would have liked to make Esme's socks out of that - but she picked purple instead in the red heart. Besides finishing those I did some laundry and sweeping, gave Esme a bath and cleaned out some unnecessary things from Esme's room so I could see the floor again *ha*. 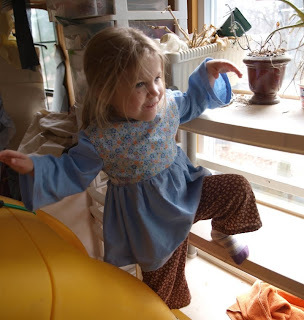 Later Esme was in her room watching me clean up and helping/dismantling my progress when she saw the moon out of the window by the shelving. She had to look all the way up from a very steep angle to see it - and I craned my neck up to see what she was talking about. It wasn't where I had expected to see it, so I thought she was kidding me at first. I told her good job and it was a pretty moon. A minute later I draw Mark's attention over there because she has her mumum cow (angel with wings) and baby cow 'flying' around and stopping to look at the moon together. 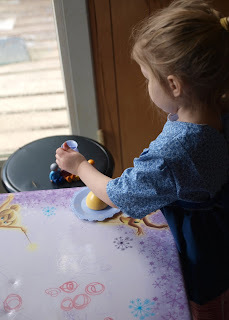 Then she took a few more turns finding other toys to show the moon to and having them talk about it together. It was very very cute. I have to go to work now and it is snowing HUGE flakes! LATER: I came home from work early just in time -- the truck acted a lot like a sled for the entire way down the back road here. If the slush had frozen over (which it is supposed to tonight) it would have been impassable. After I had been home for a bit we all went out and made little snowmen and threw snowballs at each other. Esme had a grand time and didn't want to come in. Nova the puppy ate one of my snowmen TWICE when I was looking for sticks and rocks to put in him. It was funny - because she waited until my back was turned both times and Mark saw her do it out the window the first time - and I caught her in mid chomp the second time! Esme was pretty good at throwing snowballs once she got the idea - and we all laughed a lot. This is the remake of the blue day dress - in some other fabric I had lying around that isn't a wonderful match but is good enough. It is what I am holding in the pictures above. Esme 'helped' me make it last night. I told Mark she could be a red breasted robin for spring ;) He said I should make an embroidery for the front of it as a little bird. It seems to fit her quite well, the only place it pulls now is the place where the ties pull it back --- which is good. It still has the 'second arm' problem where she has to slow down and not throw a fit for her second arm to go in nicely - or else she gets it caught up inside.... I really don't know why she doesn't have that problem on her cow dress or the Cinderella dress -- I need to look more into that. An idea of what is different about it. The orange lines are the new pattern. Then I cut the back of the dress bodice to match the changes and made the sleeve narrower. We have been giving Esme piggyback rides but she calls it 'I ride the turtle' - her own description from seeing Otis in the movie Milo and Otis ride the turtle to shore and playing with her bathtub turtle having her little figures ride it. It is very funny to hear her say that! This is the dress made yesterday - it needs some analysis to see if there is any better alteration of this pattern to be made. I took some pictures of her in motion as well as standing still. The more it is on her the more I like it in general - but there are elements of her body shape that can be altered better for. See below how the dress pulls funny across her chest as she raises her arms. There is also something pulling right at the neck when she flexes and at the waistline. These are all things that COULD be fixed but may take a few variations in order to find the best solution. It's obvious the sleeves can be narrowed. A lot of her dresses have these bell sleeves because they are easy and never constricting - but they do get in the way some elsewise, as well - like getting severely wet when washing hands. The skirt can be dropped but will need longer zippers than the 7 inch ones in my collection. Mark says I can just drop the zipper lower and put a button at the top of the dress - and/or drop the neckline on both sides. Also the sleeve head can be brought up - but that will be difficult if the neckline is also brought down - it will leave very little shoulder seam. The dress would look better with a higher sleeve head - but would it move as well with her? As can be seen in these pictures she is VERY much a little monkey - especially around her bed. Having 'loose-fitting' clothing but not TOO loose is important for her to as she is so active. 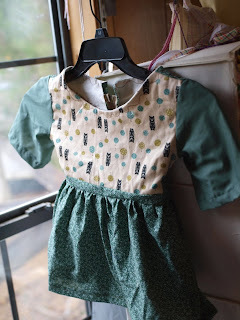 Just another simple day dress I've been meaning to make for Esme. On the hanger it looks a lot like the one she is wearing in these pictures - although I used the pattern from her red dirndl without the dropped waist. The fabric is something I bought in Jackson in December and have really been meaning to use since then for exactly this type of simple everyday dress. I put the zipper in and put white grosgrain ribbon ties on it after the picture was taken. The ribbon came as wrapping around the blanket sleepers at Christmas - but it is a perfect item for dress ties - just make a little postage stamp of edgebound dress fabric to zigzag securely over the front end and tie knots at the back of the tie. The Cinderella dress (she is wearing) has ties recycled from some other item's ribbon and they were a 'mock-up' at the time when my machine was acting up but have really impressed me in their durability. I can almost feel her getting taller just looking at this picture! We haven't been up because Mark is still down some with this cold and we definitely do not Grandpa to get any more of it. Also I was having a bit of a dizzy spell myself when I got home from work yesterday - and it lasted nearly until noon this morning before it let me go enough to start working on projects. 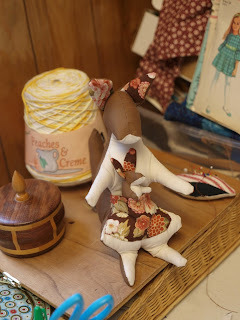 I think I've had my head down knitting and sewing too much lately - and am feeling the effects that has on that nerve. And here she is showing me how much she loves the fabric - and hugging it and trying to take it all over the room. I know it is hard to tell but I really have tried to organize this space some in the past week. I folded and tucked away a lot of the fabric into a plastic bucket, recovered what yarn I could from what had been shoved into a corner and organized the patterns some into 'usable', 'done for' and 'future use' piles. Some of the fabric would not fit, so it is still stacked on the chair, mostly lining material, but that corner there was nearly full of fabric stacked up to the shelf, before... not all of it usable. 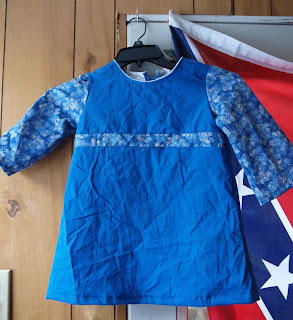 The plain blue fabric for the dress skirt was one of those stacked on top of the shelf - and it has actually faded a little in the sunlight coming in that window. What a lesson for me! I thought that was a worry only of the past. I probably need to invest in some sort of high-up double-door wall cabinet there for the good fabric to put in and then put a lock on it so Esme can't get into it. I have tomorrow off as well - but we need to grocery shop. Esme went to sleep very well tonight after I read her four books on the electric blanket on the bed *hehe* that blanket is like knock-out juice for all of us when it is cold. I admit I turned it to medium on purpose while she was sitting on it with me in hopes it would make her settle down some and want to sleep. It worked. After the fourth book she was lying there nearly asleep. 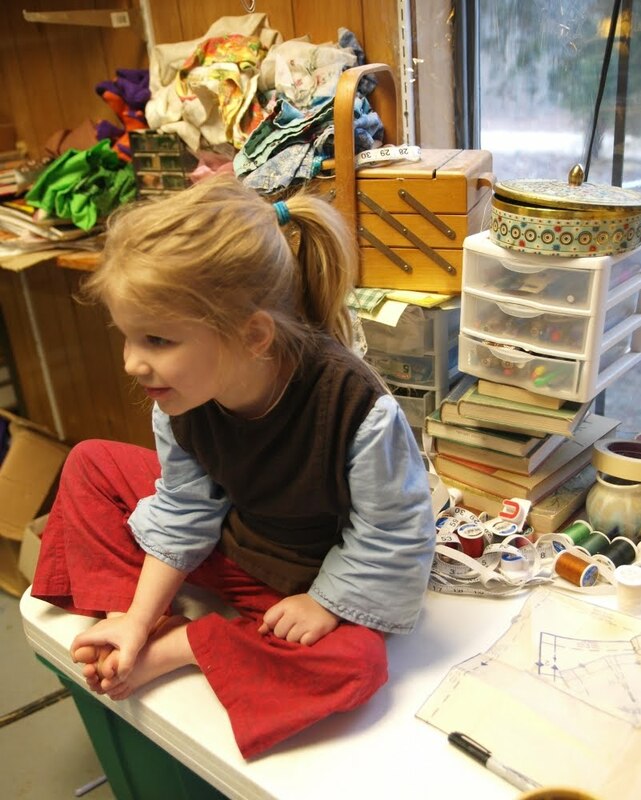 I was talking to her about what I was doing - knitting a sock, and then I said I was a mumum good at making things (she nods) like the sock I was knitting and making dresses and pants (nod nod) and I like to do those things. Then I asked her what was Daddy good at? We said Daddy was good at cooking pizzas and chicken and bread - he cooks very well, he is good at that and likes to do that. And I asked her what she was good at - and she thought hard - I said she was good at singing and playing? (she nods) And Daddy said she is good at making bad smells and being loud (she looks confused) I said yes - but we we like her singing and playing. (nod nod) And then I asked her if she was going to go to sleep and she said 'no sleep I play' while her eyes were closing even then.. and within minutes she had konked out. Physical: She is trying to skip, do the splits and open the doorknob to the outside. She has not mastered the last one yet - wont squeeze it AND turn at the same time. She still locks and unlocks the other knobs in the house and can open and close them fine. She is insisting pulling her own pants up once we help her get her legs in - and I always make her pick her own clothes out of the drawers and push them back in. Sometimes she puts her own clothes in the hamper and cycles through several pairs of socks a day, that way -- pulling them off and putting them in the hamper and then crying loudly about needing new socks less than an hour later. Better about letting me wash and brush her hair and about participating with washing face and hands. 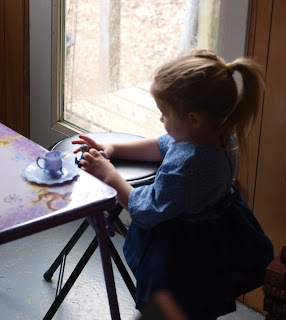 We wash hands before breakfast and lunch and she has to get her stairstool and most of the time I ask her to put it back under the big table before we go upstairs. She has picked up some mannerisms I'll include here - sitting down with her back to us and folding her arms when she is acting defiant - and also walking away after we didn't understand something and doing this odd half-turn while trailing her foot and stretching out her hand palm up as if she is saying to some imaginary person 'I told them...' She is so dramatic, it is hilarious sometimes. She plays 'baseball' with anything resembling a bat and a ball. If she is hitting she does a fairly good job but counts any connection as a 'good job I hit it.' If she is 'pitching' she does a little whirly windup with sound effects and then pitches in an approximate direction. That cracks me up. Language: Continued explosion from last month - sentences are more complete and she has more ideas she wants to express. 'Oh boy goody goody goody' when she likes something. Yesterday when she wanted me out of bed much too early she said among other things 'come come little feet - come with downstairs!' That is something I tell HER when we are ready to go downstairs (the little feet part). She is also telling me 'don't want' to a lot of things, which is hard to tell apart from what she DOES want, sometimes, especially when the 'don't is quiet. She'll tell me 'don't touch that' about my computer keyboard. She has long discussions with and between her toys. Her Grandma doll is in the ice cream shop of the tiny town right now saying she wants to go to the library very loudly. She describes things by their color (red shirt) and is more interested in what makes a 'boy' again - she thinks it is a ball cap and will often point to a man wearing a hat in the store and say he is a boy. Sometimes she will call herself a 'red girl' if she is wearing a red shirt - and mumum is a grey girl in my grey jacket and so on and so forth. She cracked me up last week when she was playing with toys and one of them needed saving - she pointed one finger up and said 'da da de da!' and something about up and up and away to the save him. She is picking things up faster than we can remember where they are from, now. Reasoning Skills/Imagination: People who have met her or read my Facebook posts say she has a very big imagination for her age. 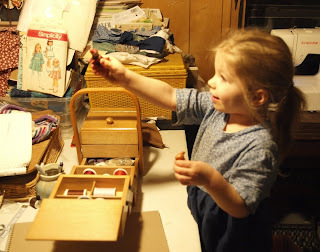 She also still gives us imaginary somethings and talks away with them and puts them into her games. She still amazes me with her ability to put connections together. 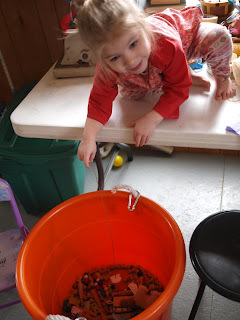 Some examples: the chain magnetically attaching to the letters in the bucket - so the letters are fish now and she somehow knows that only the chain does that - and only to the letters, without a lot of investigation. She found her baby doll and the bottle and expanded the game by having mama mousie give the bottle to the baby, which was difficult as the bottle was twice as large as mama mouse! A little skateboard she got last week in a thrift store package and she immediately has all her toys riding it around, doing 'tricks', falling down and then today she hung it by the front wheels off the top of her dollhouse and had all the toys coming to ask 'what are you doing - what is going on HERE?' 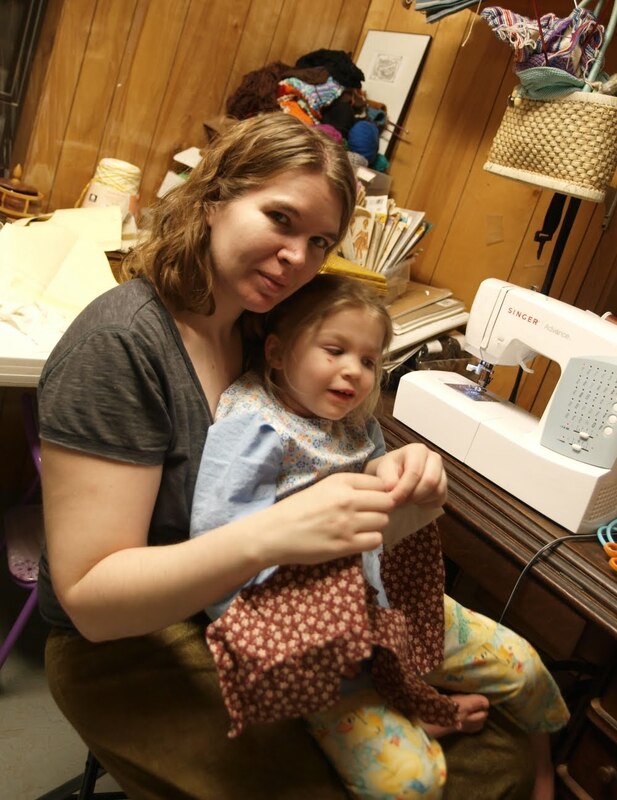 When I am sewing and show her what I am making and she likes it - she stops bugging me incessantly and lets me sew, and sometimes even HELPS (like handing me pins to put in the sleeve of Lizzie's dress). But then she told me her dress was pretty she was wearing and wouldn't put it to try on (not sure if she understood it was for someone else - she might have, by the time it was done). Reading/Numbers/Etc. : Counting better, not missing 9,10 as much. She sort of understands addition and subtraction on some level but isn't sure how I know what the number will be without counting. Reading is about the same - she recognizes her sight words and anything that looks like them is mistaken until she learns it. We have tried a little 'decoding' of small words but she still is seeing even 3-letter words as sight words. She has a lot of time yet and as long as she is interested I'll keep doing it here and there. She does still bring me the letter box at times. Her copying skills in building, singing songs, playing new games etc are really improving. She was playing games at the library and got every letter right on the letter train (which she has done for a long time) but then went to the coloring screen and got the idea quite quickly that every little missed area needed to be caught carefully and filled in. Her dexterity with the no-click mouse on that game is very good. She still needs patience and encouragement to do any click game, which usually she gets mad about. Other: I am amused and surprised by her sense of justice still. She wants everyone to go to bed and get up at the same time, all the animals to get a bite of the end of the food, always wants to get five small candies or three jellybeans and looks jilted when (mom usually) gives her less. Her jellybean bank gave her two jellybeans 'for the price of one' the other day and she brought one of them to me and told me it was for me. Yet she says I can't eat when I get home and she has already eaten - because 'I gotta play with you! No eat Mumum!' and doesn't understand or care because it is happening at a different time and she isn't hungry. These are the usual causes of her tantrums - she is trying to assert control over something, won't listen to the reasoning we have and we just go ahead and do it anyway - leaving her to cry until she straightens up and realizes she isn't the boss. Her empathy is developing more, when I am sick and she finally stops trying to drag me up and starts to copy Daddy in how to take care of me (feel forehead, tuck in, make me drink etc). But this morning I was having a dizzy spell and she was trying to make a fuss on the stairs (not good) so I told her I was going to leave her there and get her cereal or she could come with me. She went to Daddy and told him Mumum was 'broken' and he needed to come help. He was worried I had fallen - but in truth, I just wasn't acting the way she wanted me to or expected me to! Last night when I was sewing Esme was playing her usual 'pretend' catch fish with a piece of ribbon, but the cat took off with the ribbon. She found this necklace chain in one of my containers on the worktable and started using it - without me really paying attention. Then she actually CAUGHT a 'fish', one of the magnetic letters in the box. She is still playing it this morning. She really needs supervision though - because she already fell off the table once doing it - and I caught her in midair because I was sitting at the sewing machine. *sigh* - But she falls off chairs and our bed or her own bed with and without trying all day long *ha*... and at least now she is holding on to the edge of the table and gripping with her feet when she does it. I finished a pair of pants for Lizzie - also out of a remnant I had. I put a wide hem on the bottom and made the elastic the waist size her hip measurement matched.... since it is elastic it should adjust okay. 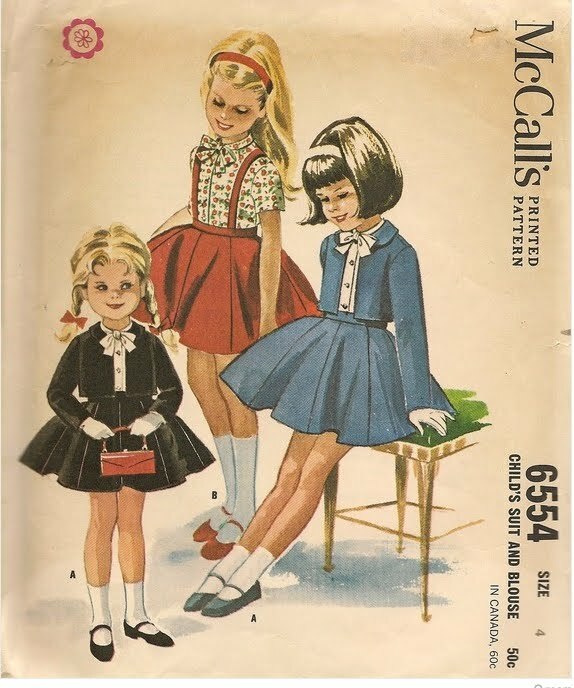 I'm bringing an older pair of Esme's pants (the red doggie ones) to work for a younger girl (Gwinifer) to try - if they fit her okay I'll use the old pattern to make hers, if they are too short on her then I'll make Esme's new pattern for her pants. 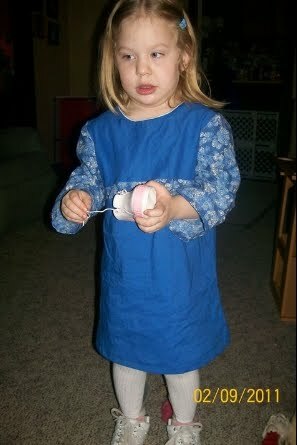 I already know she fits the raglan shirt pattern really well and have a yard and a half set aside especially for her. 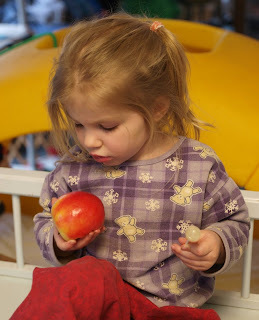 Little bits: This morning Esme said 'Esme red girl, Mumum grey girl, Daddy grey ... Daddy!' I pointed out that Daddy's shirt was actually green. Then she got this look and said 'Oh let's see - let's see the green' and went over to him at his desk and inspected his shirt. 'Oh, that's the green, ok nice.' His undershirt is grey, though... so she was partially right ;) She has been making a few good observations the past few days I can't remember all of them right now. 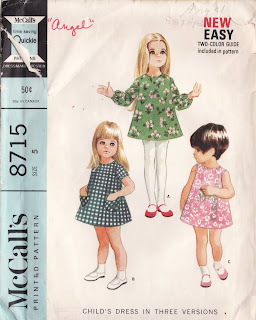 Looking through my patterns trying to find something for Lizzie's pants I realize - there is a HUGE difference in the styles the vintage patterns had for 2-4 and 5-7. And her measurements put her solidly between a 4 and a 5 with chest/hips, and the waist of a 5-6, so I would have to be careful about the styles that I make. The 5's I have, with the exception of one - are mostly A-line jumpers or tunics and pants. There is only one real 'dress' in the mix - the one I made Esme's dark green one from that is still waiting for her to grow into it. Then the patterns jump up to the size 6 - which has quite a few nice dress styles that just couldn't be found in the 4 and under sizes. Then at size 7 they start looking like 'grown up' dresses and pants sized down, with a few 'awkward' patterns for dealing with the very skinny long middle problem. I've tried to keep away from buying too many 7s until I know Esme is still going to let me sew for her at that age! 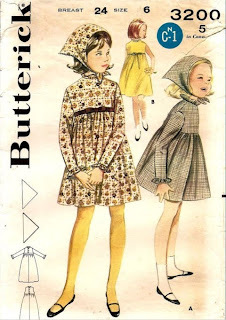 All of that means nothing to anyone not faced with a stack of vintage children's patterns. ha. But anyway, Esme is going to get to that size in another 6 months to a year - so I need to think about it! 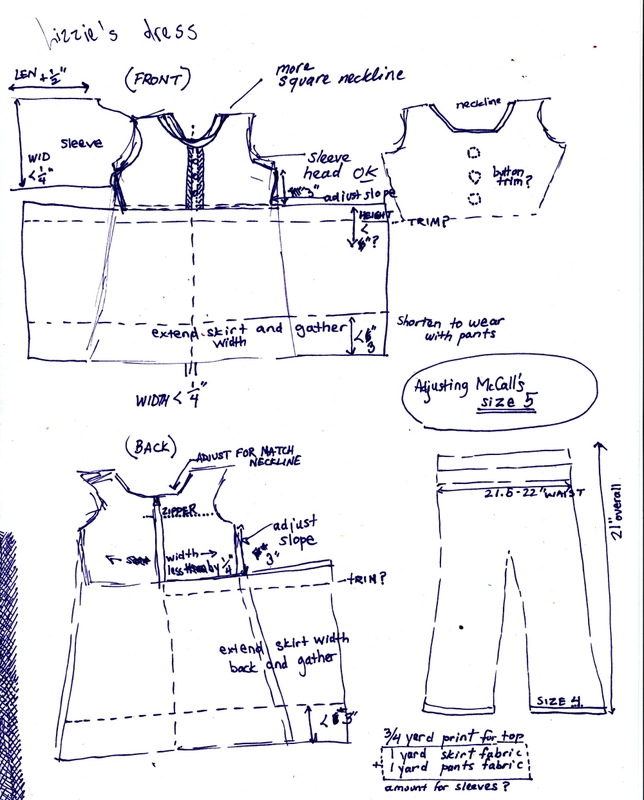 Lizzie's measurements showed she was a size 5 with a larger waist proportion than Esme - so I needed a pattern that was more 'straight' instead of hourglass - for safety, because she is 1800 miles away from me and I can't try it on her or even hold it up to her! This pattern has a lot of free swing in the middle and the skirt can be shortened to make more of a 'shirt' on the second pass if it constricts her legs too much. She is also a few inches taller than Esme - an inch taller in the legs. She must get that from my lumberjack of a brother (6'3"!) And her mom is taller, too. So - here we go. 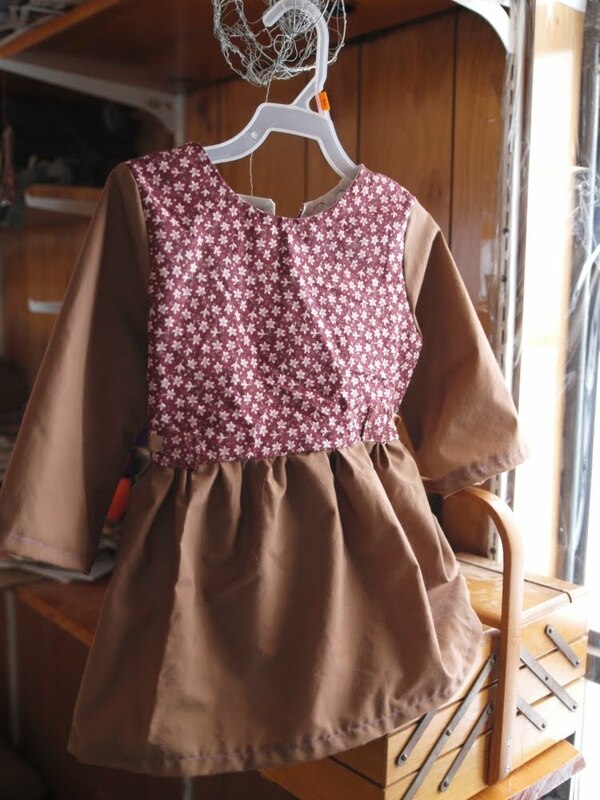 A size 5 vintage dress for my niece Elizabeth. 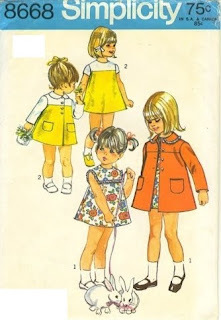 This is the pattern I used - something I had saved for Esme but she hasn't caught up to yet. 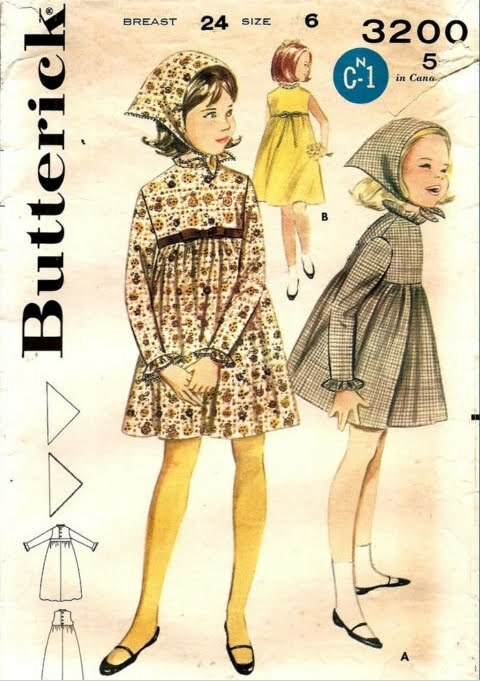 I just LOVE the illustrations on this pattern envelope - and the dress itself is very 'plain and simple' - easy to alter into anything needed. We went into town this morning and I found some fantastic fabric with sailing mathematical measurements on it. It is reserved for something for me. My sister-in-law came through with measurements on Lizzie, and they match a size 5 vintage (even though she is younger than Esme by several months, who wears a size 3 or 4 vintage with longer arms and legs). She had outgrown the 'frog' set I had sent to her (and a matching one to Emily) and was very upset this morning when her mama put it away and said it was too small. I have nearly finished a dress for her tonight and will do a try-on for Esme after the zipper is sewn in, and pictures tomorrow. 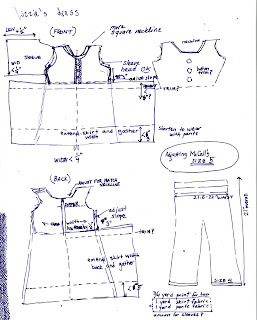 She gave me the four main measurements I needed to make a set of clothes that fit. 3.) 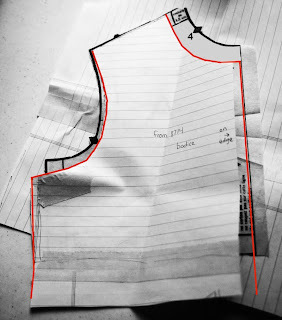 Snug (but not tight) length around the chest under the arms at the widest part. 4.) Length from hip bone to ankle bone along the side of the leg. With anything long-sleeved that is meant to fit well - a fifth measurement from the top of the shoulder to the wrist bone would be included as well. I'm making her a dress that does not have to go all the way down to the wrist - so I didn't get that measurement. Men's shirts would also need a good neck measurement. Esme has been FAIRLY good about letting me sew for the past three hours. But, she is getting antsy now that I'm off the machine and asking for 'Can I have a whee please?' (swing her around in a big bucket). Earlier today we went to the library and got a chicken leg and she was saying 'oh boy goody goody goody!' about both of those. It was VERY cute. 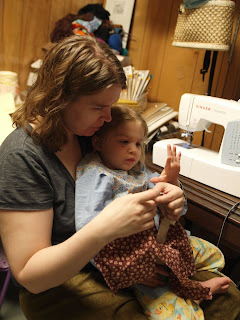 LATER: I made Esme her food and she sat down to eat and I sat down to sew in the zipper. Halfway through her plate she asked to go to bed - for ALL of us to go to bed, and got her blanket and her pillow and her frog all ready. BUT - that is really weird for her! She has all my mommy beacons saying 'is she sick?' but her temperature is normal. I put her remainder of her food in the fridge and put her to bed and she is fast asleep. I am caught between do I work on my knitting or start another dress for her that she can keep? Or - the pants? I promised Lizzie a pair of pants to go with the dress.